TCi (GB) Ltd represents unparalleled service in commercial construction and interiors, office and welfare furniture supply and installation. Since incorporation in 2006, TCi has experienced remarkable growth and success. Originally known as Town & Country Office Supplies, providing commercial office furniture to local companies, an opportunity to supply construction site cabin furniture gave the business a new niche. 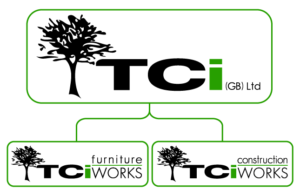 With expansion into turnkey office and work-space refurbishment projects, the company re-branded as TC Office Interiors, later re-branding again as TCi (GB) Ltd whilst both commercial furniture and fit-out/refurbishment divisions gained momentum. In 2016, TCi won a competitive tender to become a tier 1 FF&E contractor to EDF Energy’s Hinkley Point C Nuclear New build (NNB) development, promoting local investment from the project. So far, the contract has enabled the employment of dedicated staff from throughout the region, alongside the use of local manufacturers, suppliers and services wherever possible. At the beginning of 2017, TCi (GB) Ltd developed two new brands to identify the two distinct sides to the business. TCi construction WORKS provides specialist commercial fit-out and refurbishment in the South West, whilst TCi furniture WORKS operates a commercial office and welfare furniture supply and install service throughout the UK. In June, we launched our ECO360 sustainable cardboard desk, providing a 100% recyclable solution for site accommodation offices. Visit one of our brand sites for more information, or contact us to see how we can help you today!